Full length native protein (purified) corresponding to Human C3d. EpitopeEpitope specificity differs from that of ab17454 and ab17455. Storage instructionsShipped at 4°C. Store at +4°C short term (1-2 weeks). Upon delivery aliquot. Store at -20°C. Avoid freeze / thaw cycle. Our Abpromise guarantee covers the use of ab17453 in the following tested applications. ELISA 1/30000. Strong reaction is seen in ELISA with a C3 coat or when used as detection antibody in sandwich ELISA in combination with a polyclonal C3 antibody. ab17453 also reacts with C3b deposited on coated antibody molecules. WB Use at an assay dependent concentration. Predicted molecular weight: 187 kDa. In Western blotting after SDS-PAGE, ab17453 reacts with C3 in both reduced and unreduced forms. ab170190-Mouse monoclonal IgG1, is suitable for use as an isotype control with this antibody. FunctionC3 plays a central role in the activation of the complement system. Its processing by C3 convertase is the central reaction in both classical and alternative complement pathways. After activation C3b can bind covalently, via its reactive thioester, to cell surface carbohydrates or immune aggregates. Involvement in diseaseDefects in C3 are the cause of complement component 3 deficiency (C3D) [MIM:613779]. A rare defect of the complement classical pathway. Patients develop recurrent, severe, pyogenic infections because of ineffective opsonization of pathogens. Some patients may also develop autoimmune disorders, such as arthralgia and vasculitic rashes, lupus-like syndrome and membranoproliferative glomerulonephritis. Sequence similaritiesContains 1 anaphylatoxin-like domain. modificationsC3b is rapidly split in two positions by factor I and a cofactor to form iC3b (inactivated C3b) and C3f which is released. Then iC3b is slowly cleaved (possibly by factor I) to form C3c (beta chain + alpha' chain fragment 1 + alpha' chain fragment 2), C3dg and C3f. Other proteases produce other fragments such as C3d or C3g. Immunohistochemical analysis of human kidney labelling C3d with ab17453 at a dilution of 1/10. Plasma of veins were stained strongly. 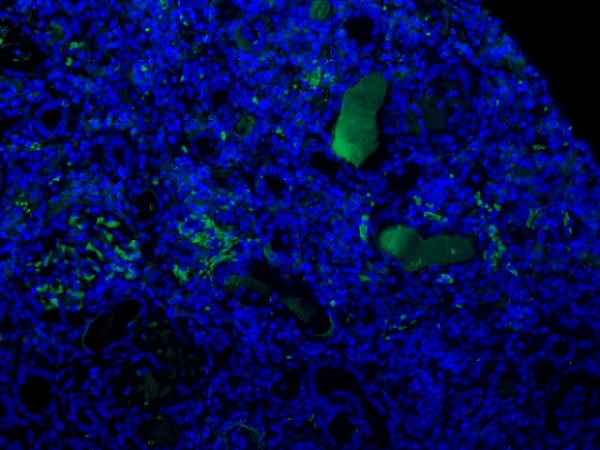 Immunofluorescence analysis of human kidney labelling C3d with ab17453 at a dilution of 1/10. Plasma of veins were stained strongly. Наименование: Антитела Anti-C3d [7C10], мышиные моноклональные / Anti-C3d antibody [7C10].